What with it being the season for resolutions and all, I thought I'd take a few minutes over my (second) bacon sandwich to put down in print the home brewing aims I have for 2010. I've got a good few brews under my belt now and know my kit pretty well. It's time to push on and improve my brewing processes and the quality of the beer I make. There are areas in which I know I can make improvements and there are things I'm keen to try out. 1. Improve my kit. 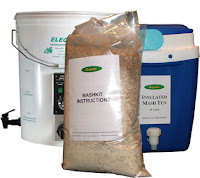 Namely: re-calibrate my mash tun and boiler/HLT; upgrade the insulation on my mash tun. This will allow for greater consistency between batches and improved control of mash temperature. 2. Brew smaller batches, more frequently. I love beer but I've never been one that enjoys drinking to excess. A lot of home brewers criticise small batches because it takes roughly the same effort to brew 50 litres or 15 litres. Despite this, I brewed 10 litres of black IPA over Christmas and found the brew length to be about right. I rather end up with 60 small bottles of three different beers, than 60 all the same. If something turns out well, I can always brew more of it! 3. Brew a low alcohol, refreshing, hoppy beer for summer. I've talked briefly about this here. I want it to be around 2%, red in colour, hoppy, crisp and refreshing. 4. Attempt something innovative. I want to try something that hasn't been done before or is rarely ever done. It could be the way I age the beer, an unusual adjunct, a twist on the brewing process. Ideas welcome. By no means a huge list, but part of the fun of home brewing is letting things develop and change as you go. A big "to do" list doesn't fit with that philosophy, so this is more a short list of things I know I want to do. It's my intention to track progress using this blog, so keep reading to find out how things play out. Like the idea of smaller batches. That's one worry I always had of homebrewing - making a batch and being left with more bottles than I can possibly drink!! As for something innovative... good luck! Salt and pepper stout?! Get a little wine pin and some wild yeast. Have you read Randy Mosher's Radical Brewing? If not then I recommend it - it's a great read! Interesting point about small beer. As far as I know, small beer is made from the second runnings of a brew. I don't see any reason why this wouldn't be achievable on homebrew kit. The only problem would be controling the gravity ... both of the main batch and the small beer batch. It would probably be easier just to set out with the intentions of brewing a beer with low gravity. Thanks for the suggestions. Radical Brewing is on my reading list, just need to find the time to get round to it. I've brewed low gravity beers from kits a couple of times now, the first time was by accident, ended up with a 3.5% Great Eastern. This time I brewed a Muntons Smugglers kit to 25L and ended up with 3.3%. It will be ready by end of Jan, so I'll let you know. Yeah, do let me know. I wonder if that would give the same result as deliberately brewing a low strength beer. Wouldnt the amount of hops be intended for a shorter brew length, and therefore be a bit watered down too? Possibly, the Great Eastern I brewed to 25L instead of 22 and didn't suffer for the taste. That said there's nothing wrong with adding a hopped tea or dry hopping in the FV to boost the hop flavour. I think there is a big future in lower alcohol beers, I had a bottle of a Bagder beer that was around the 2.5% and it certainly didn't suffer from lack of hoppiness. I think you're right, to a certain degree. I can't, however, imagine them catching on with the mass pubic. Peope will surely see "2.3%" and think ... "nope, not for me". It's a sad thing to say, but I honestly can't see them catching on with the general drinking public. For me though, I can't think of anything better than a hoppy, low ABV beer to sup after work on a warm summers evening.